On the morning of February 6, 2015, my wife Danielle and I received the news that Matthew Iserhoff, Sr. had passed away that morning. He was the father of our son-in-law, Matthew A. Iserhoff. Our hearts were broken. I first met Mr. Iserhoff in Montreal in 1970. He was enrolled at McGill University’s Education Program and I was following a two-year pre-university program at Sir George Williams University (now Concordia). I knew Mr. Iserhoff to be a serious, dedicated and accomplished man with dreams he pursued with great success. During our time in Montreal he gave me good pointers on how to succeed in school and about surviving in an urban setting. He was my role model. I hadn’t seen Mr. Iserhoff for many years after Danielle and I returned home in 1974. When we went back to Montreal in the early 1980s to further our studies, I ran into him at a bus stop; that’s when he told me his eight-year old son (Matthew Jr.) had had a terrible accident and was fighting for his life after multiple surgeries (his son recovered and just a little over a decade later, became my son-in-law). In the face of this terrible tragedy Mr. Iserhoff displayed great faith and remained strong. Mr. Iserhoff served the Cree Nation and his community in a number of capacities. He was one of the first hosts of CBC’s Maamuitaau, a position he held for many years. He also worked for the Cree School Board in a number of capacities over a 34-year period until he retired a couple of years ago. 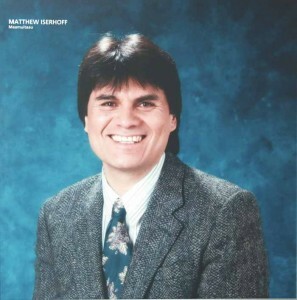 The late Matthew Iserhoff, Sr. will be remembered as a dedicated and loving family man. He was a man of great compassion for life, a devoted husband to Annie (Neeposh) and a loving and caring father to Ashley, Matthew, Jr. and Shawn. He exemplified what every husband, father, grandfather, brother and uncle and friend should be – always doing what he thought necessary for the welfare and happiness of others. His legacy in this regard will live on throughout generations to come. For all the good he’s done for all of us who knew him well, we know late Matthew Iserhoff, Sr. is well on his journey in the Spirit World – the journey back home to Heaven. I sat in the back room of the funeral home on the evening of Matthew’s visitation. I sat by myself running through some memories I had of him. There was a beautiful procession of friends, associates, family and neighbours who came to pay their respects. It was a deeply moving scene. Suddenly, I caught a glimpse of my neighbour coming in. Dany went to acknowledge Matthew and his family. He then noticed me and came to sit. I was really curious; I’d never associated Dany with Matthew at all. In French I asked him how he knew Matthew. He replied that he’d been playing hockey with him once or twice a week for 20 years. As my neighbour is a unilingual francophone, I asked if Matthew could speak French. My neighbour laughed, replying no, not really, but that his English was rockier than Matthew’s French. I asked him if he knew anything about Matthew. He said no, not really. Over 20 years, Mathew had not shared, because he couldn’t, but most likely didn’t feel the need to. I proceeded to tell Dany some of the things I knew and he sat there interested, curious, and amazed. I think this says a lot about what kind of effect Matthew had on people. Those who knew him better can point to moments, exchanges, and experiences with him, to the stories and achievements of his wife and children. But my neighbour knew none of these stories. He knew Matthew solely as a teammate, sharing all the camaraderie, bravado, and laughter and nothing more and nothing less, than those moments in the locker room and on the ice. And yet he felt compelled to pay his respects, to honour those moments with Matthew. I was fortunate enough to be able to point to some anecdotes and stories. I met Julie and then Matthew and Annie and the boys early in my first few years in Chibougamau. As the English teacher at MacLean Memorial School, I had the great fortune of teaching Matthew Jr. and Shawn, bright, eager, motivated kids, hungry for truth, albeit with the patience and determination to try and work towards it. In 1995, my then-girlfriend, now wife, Annabel, became pregnant. When I first came up to teach in Chibougamau in 1991, I was a kid – in my 30s, but still a kid. I was terrified of becoming a father. When I’d see Matthew, he’d smile and say to me, “Better get your fishing trips in now, because when that baby comes you won’t be doing any.” And I could feel my brain start to bounce around inside my head. It couldn’t be true! And he’d stand there with that faraway look, those twinkling eyes, and that big smile on his face. But when I stood back and looked at Matthew, a proud man, an even prouder father, I told myself, ”Well, if that’s what fatherhood can do for a man, well it’s going to be alright.” Matthew knew what courage was, he knew where it was, and he had faith I’d find it. Matthew had a marvellous way of making moments special. He could pack more meaning into a handshake, a smile, a joke, a gesture than anyone I’ve ever met. And he did this through kindness and humour, and living according to the values that he held dear. And he did this through genuine caring. Every time I would meet him he would always ask about each of my kids, and my wife, and how school was going. Whether it was a walking-out ceremony or a parent-teacher interview at the school (always the first parent there, 10 minutes before he was supposed to be), or simply encountering him on a walk, I was always delighted to see him, even though he would tease me relentlessly. I always thought that he was the type of person I could aspire to be. Not “be” him, exactly, but to have that wonderful blend of grace, humour, pride and faith in those he loved. I will miss you, Matthew. To know that we will not see that smile or hear that voice, to never see that funny way you moved your hands around when you talked, seems too cruel. But on the other hand, like many people you knew, I feel incredibly fortunate to have known you. Goodbye, my friend. Safe travels.